Hi Dino! What a great place to go swimming! It was fun to watch the video. No doubt about it - swimming is fun! What a huge pool. And all to yourselves. That looks like a great place to go swimming!! Wow wee!! We wish we could join you. We loved the video--and we really love the picture! Handsome puppies! what a great place to go swimming!!! 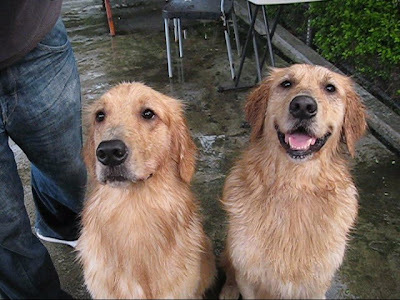 we wish to be with you and your friend and swimming all togheter!!! sure you ha d a great and funny day!!! we love your video...thanks for sharing with us!!! we love you so much and are very very happy you finally back!!! Sure you and your friend had fun swimming there! what a great time you've had! I love water and hopefully I will learn to swim myself. Ooh, Dino - I still think you're so brave to go into the water! Looks like you had a great time with your friend! Oh-ho-ho-ho! I'd sooo totally jump in there with you guys! Looked like so much fun. Dino, who jump into the pool first?Should I wear glasses now? Wow, that sure looks like fun! We LOVE swimming! Very nice video of you and Howler swimming. I wish we have a huge swimming pool in our garden. Swimming looks like fun. Mom says she is going to teach us to swim this summer.